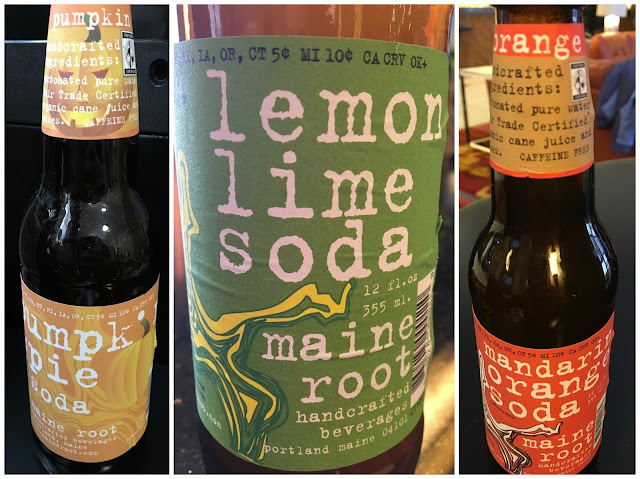 For the sodas I tried in the hotel (orange and lime) and the pumpkin pie one that I found at Wegmans a week later, the ingredient list is short and sweet for all of them. Just carbonated pure water, Fair Trade Certified organic cane juice, and spices. No caffeine, no sugar-free sweeteners (such as aspartame), no gluten, dairy, or other allergens. Plain and simple. My favorite of the trio was definitely the mandarin orange, which tasted how a orange creamsicle might taste if it was melted and bottled. So smooth and satisfying, it was like tasting a bit of summer amidst the whirling winter snow. My next favorite was the pumpkin pie, which was was sweet with a bit of spice. Coming up last in my taste test was the lemon lime, which wasn't bad at all, just coming up a bit short after the orange and pumpkin. It just did not have the lemon or lime-y flavor I was expecting. The sodas all are sweet, and I cannot deny their sugar content. One was definitely enough for me for a day. However, in moderation, they are sweet treat- similar to baked goods or other treats. Although they have not turned me into a daily soda drinker, I will certainly keep them in mind on the rare occasion that I want a beverage besides water. These sodas are not only good for you, but good for the planet too, because Fair Trade means that the cane juice used is sourced to be eco-friendly and pesticide-reduced. For more information about Maine Root, click here. Besides the sodas featured, they also offer other drunks such as lemonades, root beer, ginger brew, among others. I found them at Marriott-family hotel and Wegmans in Hunt Valley, MD.